Soups and Stew and Chili…Oh My! The best way to describe a thermal cooker is to think of a portable, non-electric slow cooker. 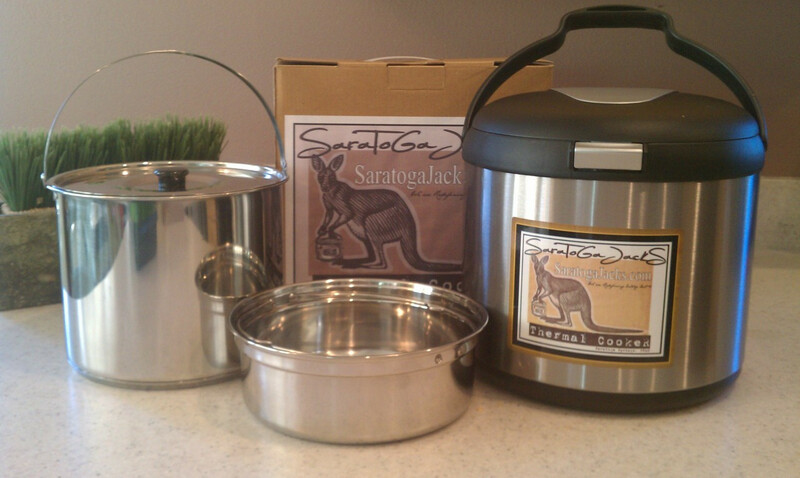 Everything you love about slow cooking, without the electricity and it is portable! You conserve energy and fuel through the use of a thermal cooker. If you are in an emergency, it saves on your fuel consumption. If you are using it at home, it saves on your electricity bill. If you love the outdoors, you can start your dinner in camp, leave for the activities of the day, and come back to a hot meal, without worrying about leaving an open flame at your campsite. If you travel and want a healthy, home cooked meal upon arrival at your destination you have it ready. No more looking for restaurants when you are tired and do not know the area. The outer thermal cooker is a highly insulated stainless steel lined thermal unit. The steel is 304-18/10 surgical stainless steel. It has a handle that folds up and down for easy portability. The lid on the unit shuts when closed. The inner stainless steel cooking pots are also made from 304-18/10 surgical stainless steel. The inner cooking pots consist of one large pot with a heavy duty, triple layered, bottom and a smaller pot that can be nested inside the larger pot if desired. This provides a place for an optional small side dish. Use of the smaller pot is optional. The smaller pot can be removed to accommodate greater quantities of food in the larger pot. It also comes with one separate lid that fits on top of either pot. To cook, you remove the two inner cooking pots from the thermal sleeve. You place the ingredients of your meal into the pot. Bring the ingredients to a hard even boil using whatever heating source you have with you. It can be your electric, gas or induction stove. The amazing thing is if this is not available because the power is out or any other scenario you can use other options. This may be a butane stove, propane, cube stove, Volcano Stove or the fire. Keep it at a hard boil for an average of 2-5 minutes (time varies and can be longer depending on the recipe), stirring to ensure it does not burn on the bottom. Turn off your fuel source and quickly transfer the pot(s) into the thermal sleeve. Your food continues to slow cook in the thermal sleeve for hours! The thermal cooker traps the thermal energy that comes off the hard boil. You can even take it with you because the thermal sleeve is portable! The 5.5 liter unit will feed 3-5 people. The 7 liter unit feeds 7-10 people. Here are some of the basic rules to follow when using your thermal cooker. ONE: Always make sure all ingredients are thawed. TWO: Always make sure your ingredients are covered in liquid and can be brought to a constant hard boil first to start cooking. THREE: To get the maximum slow cook time make sure you always have the thermal cooker as full as possible. FOUR: Check the temperature of your meal before serving to ensure safe serving temperatures. FIVE: If dinner is at six get it started and in the thermal cooker at the appropriate time. For detailed information regarding the 5 Basic Rules go to our Successful Meals tab. Listed below are only some ideas of things you can cook in the thermal cooker. You can try any recipe you would do in a slow cooker only slightly modified. Rice and other grains are easy once you adjust the amount of water you use. Even deserts and breads are possible. See our Recipe tab for some meal ideas. We will be posting more. We hope this helps you understand the advantages of a thermal cooker! Whether you are preparing for an emergency, you love outdoors as a camper or hunter, or just want to save on your utility bills, the thermal cooker will perfectly suit your needs!